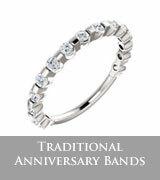 Whether you are celebrating a milestone Anniversary or buying your first Diamond Band we have the ring for you. Visit our local Houston area store today and let our diamond experts assist you in finding the perfect ring for your occasion. 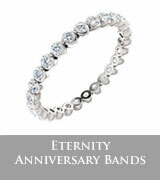 We have an enourmous selection of Diamond bands in white gold, yellow gold and platinum. 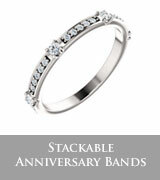 If for any reason you do not find the Anniversary Band you are looking for, just speak to one of our associates about having our in-house jewelers custom design the Anniversary band you have always dreamed of. 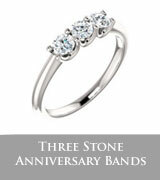 You pick the design, metal , and diamonds and we will manufactuer it for you. Want colored stones in your band? Sure!!! It is your design. Whatever you could possibly want we can do it for you. If you like you can even be part of the design process. We are more than happy to show you your design through various stages of the design process. Want to feel like you are more in control of your design? Then Houston Jewelry is the store for you.